I’m a proud and vocal book abandoner. If, after giving it the official John Irving try (reading 100 pages in hopes the story gets going named after Irving because A Prayer for Owen Meany takes forever to get going), I’m not enjoying a book I set it aside without a second thought. This is why I don’t often write negative book reviews. Sometimes, though, I will struggle through a book because of some other obligation. Usually that means Rock & Roll Bookclub, and still even then I’ve been known to abandon books that are too bad to read (*cough*A Boy Called Freebird*cough*). 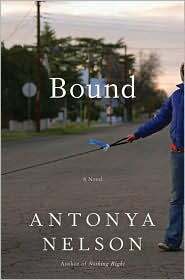 This is why I finished Antonya Nelson’s Bound even though I really didn’t want to. Right from page one, I had my reservations. The book opens in the point of view of a dog who has just survived a car crash that’s killed its owner. We spend a lot of time with the dog, meeting characters who don’t seem to have any impact on the story. When we finally get to the humans the third-person point of view is so far removed, the book feels cold. The story is about Catherine and Oliver, a rich couple in Wichita. Oliver’s a seventy-something entrepreneur who has made a habit of marrying younger women and starting successful businesses. Catherine is wife #3, an emotionally-stunted forty-something whose mother is in a nursing home after suffering a stroke. Around Christmas, Catherine learns she’s been bequeathed the fifteen-year-old daughter of her former BFF, Misty (the owner of the dog from the book’s opening). Cattie, the daughter named after Catherine, is on the run from her New England boarding school, hiding out in the home of a classmate’s sister. Oh, and then there’s the BTK — blind, torture, kill serial killer who ran rampant over Wichita in the 70s and has decided to come back and haunt the city. Catherine chose her relationship with Oliver over having a career or children. She fills her life taking care of the dogs, and her mother. She spends much of the time trying to figure out what to do with the teenager she’s been left and reminiscing about the past. Even though there’s a freshly, orphaned teen on the run there doesn’t seem to be any sense of urgency regarding finding her and making sure she’s okay. In fact, Oliver and Catherine are so cavalier and nearly heartless regarding this situation you kind of hope Cattie never lands in Wichita. The novel feels pieced together, we spend a lot of time getting to know characters who simply disappear. The BTK, which sounds intriguing, feels like an after thought and when we finally learn who the killer is it’s so disappointing we need a new word for disappointment. It’s not often that my entire Rock & Roll Bookclub feels the same way about a book, but it was unanimous, we all thought Bound was a big, dull dud. i like your john irving test. i would like to live by that rule but i usually make it 150 pages in before i abandon, but some books are only 150 pages.